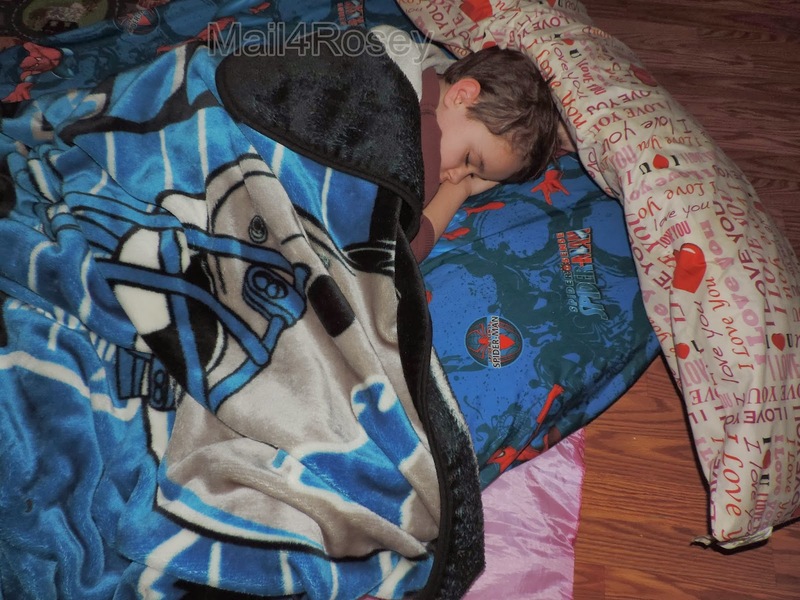 Mail4Rosey: Excuse the Mess, We're Camping (in the living room ;) )! Excuse the Mess, We're Camping (in the living room ;) )! Things feel off when my husband is out of the house. Even if he's just sitting at the dining room table all night doing his homework, he's still here. It's routine. We're used to it. We like him home. Last night he had to leave town. That left us home alone, and that happens, next to never. Since it felt a little 'off' to have dad gone, we decided to do something out of the ordinary too. Such a silly, simple thing, and yet it was so awesome. I think every parent has done this at least once (or helped set up a space for the kids to do it). we even set the real tent up in the living room once. Hubby's set up the tent in the back and we've camped out there. The teen chickened out on night two and the toddler was still gung-ho. That second night I heard the animals running around the yard at night, and from that point on, I was siding w/my daughter on 'that's enough tenting.' hahaha. how fun.... I try to get Marc and Broxton to do it, but they like the bed too much. lol, but we have "camped" in the backyard in a tent before - it was SO COLD the night we decided to do it!!! These are the kinds of fun family moments that kids remember. One New Years Eve, my parents came home, woke us all up in the middle of the night, and took us to IHOP. It was so much fun that it has become one of my forever favorite childhood memories. Yep, I've done this very thing too and it's always a big hit. Add some popcorn with the television and then you have bedding to wash the next day. Fun anyway. That sounds so fun! That is something your kids will remember! What fun! Your little guys will absolutely remember this. My husband was away too weekends ago and we did something similar! Oh that is fun! We do this when the electricity is out, so we can all gather around the wood stove. haha been there a time or three, such fun to do indeed. There were no comfort complaints (though I did wake up missing my big, comfy bed at one point during the night ;) ). Having it be someone you don't know can be better (and worse). Too bad folks don't just mind to their own. The Golden Rule and all that good stuff. Your son looks so cute, and what a fun night! I think it is fun to sleep somewhere different and have a great time doing it with someone you love! It is messy, but it is fun! This is awesome, moments you will treasure for ever. Time spend with our little ones, indoor or outdoors is well spend time. Children remember more than what we think they do. Hope you are having a lovely weekend!! Those are wonderful times and memories you will have. We have done similar things before. They love building forts and sleeping in them and hey, what's the harm? This is a great idea I will have to do this with my son sometime. Hi Rosey, we used to do that all the time with my daughter! I miss that! I'm so glad you had fun and at least he wasn't gone long. Take care and have a nice night! Thanks, Julie. Happy Week to you! Memories like that are the ones we hug to ourselves forever. So so wonderful to spend time like this at home :) I've an item on my 30 before 30 list to go camping.. Doubt we'll ever make it out to camp outside so this will be perfect! Oh this is super cute! I used to do this when I was a kid! I need to start doing it again!! The kids and I do this sometimes too. They mostly like to sleep with me when their father is away. Camping in the living room is wonderful fun! We love it! Not done too often and loved when done. Glad you had such a great time just hanging. That's how memories are built! I'm sure when the kids are grown they will get together and talk about the night they camped out with mom and had so much fun! Travis has actually set up a tent when my nephews have visited. They had fun! I'm sure your littlest man did to! BTW both my boys have always been great sleepers for the most part. Then the last week Isaak's been having nightmares, seeing things, and wanting Travis in his bed. I don't want to start any bad habits. He's scared, so I'm at a loss on what to do. #sleeping issues. And probably a whole lot warmer than camping outside right now! We do this sometimes too and we absolutely love it!!! My boys go crazy every time and a normal bedtime is impossible!! Its great to make memories like these! Hi Rosey .. fun for your son - and so right for him ... and it'll just make such a great reminder of his early life ... Let Dad and youngster enjoy themselves .. I'm pretty lucky that the kids still like simple things to have fun. :) Thank you for the compliment. These are the things that kids remember.. Mom camping out in the livingroom with them. How fun!! How wonderful! It's times like those that are made of real quality.